The author is a beef specialist with the Alabama Cooperative Extension Service based in Auburn. When feeding hay or baleage to beef cattle, quality is king. However, can stored forage quality actually be too good? Are there “forage extremes” that should be avoided when feeding beef cattle? The best place to start this discussion is by reviewing cow nutrient requirements. Beef cattle nutrient and energy needs start climbing 60 days prior to calving and reach their highest point during the 60 days following calving, or peak lactation. Energy and protein demands average 60 percent total digestible nutrients (TDN) and 12 percent crude protein (CP) for a 1,200-pound, mature brood cow in peak lactation. Cow nutrient needs decline as it moves closer to weaning a calf because of lower lactation demands. After weaning, a dry, pregnant brood cow often requires a diet that is 48 percent TDN and 7 percent CP, which leads to the question — is some hay “too good” for my cows during certain periods of the production cycle? The following provides some rules of thumb for evaluating hay and making the most efficient use of high-quality stored forage nutrients in the herd. Know the forage quality and match it with animal requirements — use the best hay to meet the greatest demands and reserve lower quality forage for dry, pregnant cows. Feed higher quality hay (58 percent TDN and 10 percent CP) to cattle as they enter the calving season because nutrient demands change rapidly during this time. A higher plane of nutrition beginning 60 days prior to calving allows cows to better maintain body condition score. 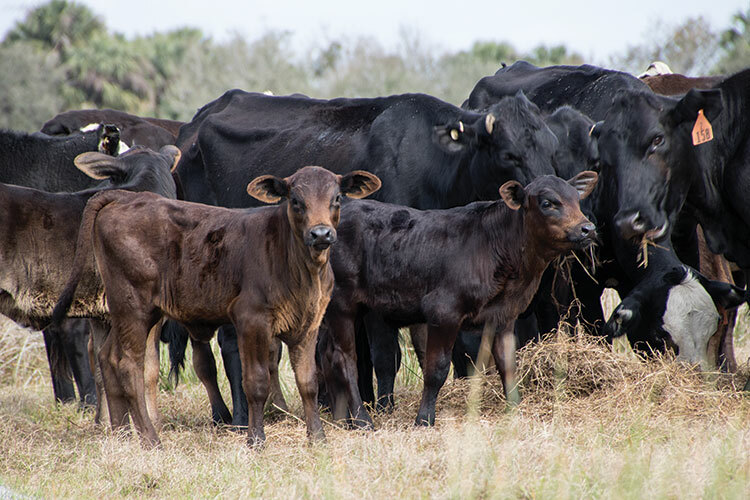 Cattle entering into peak lactation, first-calf heifers, and replacement heifers have the greatest nutrient needs and may be better suited for feeding the highest quality stored forage. If the crude protein needs are exceeded, where does the extra go? You guessed it . . . most of the time excess protein that is not used by the animal ends up being excreted in the urine, which can amount to quite a bit of “free” nitrogen that is going elsewhere in the system. Is there a way to capture some of the extra and make use of those valuable nutrients? There are three potential paths to do so. Use a limit-feeding approach: Reducing the amount of time cattle have access to hay may improve hay use efficiency with high-quality stored forage by limiting forage intake and subsequently more intentionally trying to match pounds of forage TDN and CP with daily animal needs. A limit-feeding approach is only recommended with higher quality forage. A research trial by Purdue University evaluated how much hay mature cows will consume when free-choice access to hay was reduced to a few hours per day. When access was restricted to four hours per day, hay consumption was reduced by roughly 20 percent. Estimating the amount of forage consumed when limit-feeding hay is important so that the diet can be supplemented correctly as needed to maintain animal performance. Whereas it may seem counterintuitive to supplement high-quality hay, when used in a limit-feeding approach, this may be a way to stretch hay supplies and efficiently meet cattle nutrient demands. A helpful guide on limit-feeding hay can be found in an extension guide from South Dakota State University at http:bit.ly/HFG-SDSU-limit. Dilute: High-quality hay or baleage may be used more effectively by providing a ratio of good to mid-quality bales at the time of feeding. If the quality of various lots of forage on the operation differ, providing one high-quality bale for every one or two mid-quality bales may help even out the playing field in terms of diet quality for the animal, especially for animals with lower nutrient requirements. While it is true that cattle will tend to eat the best-quality forage first, they will then move to the lower quality forage. This can have a positive associative effect on the digestion of the lower quality forage in the diet. High-quality forage provides the fuel for rumen microbes to better digest subsequent lower quality forage that might be consumed, thus improving efficiency of digestion and use by the animal. Knowing that cattle recycle a significant amount of what they consume to the environment (upward of 70 percent), there is an opportunity to uniformly distribute these nutrients on the farm during the hay feeding season. Bale grazing is a method by which rolls of hay are set out systematically across a pasture area before the winter feeding period begins, and cattle are restricted access to them using polywire fencing. Generally, cattle are allocated two to three bales initially, depending on the size of the herd, and more sections are made available as they begin to finish each bale. This strategy provides a more even distribution of nutrients across the field and the potential to capture excess nutrients from hay. A research trial in Canada observed that feeding hay during the winter in a confined area allowed the recovery of only 1 percent of the original nitrogen content of the hay being fed, whereas bale grazing helped recover close to 35 percent of the original nitrogen value. Unrolling round bales on the ground may be another option for capturing excess nutrients, but care must be taken to only provide the amount of hay that can be consumed by cows in a two-day time period; otherwise, hay losses of up to 40 percent can occur from animals bedding down, urinating, and defecating on loose hay. Moving the location of where bales are unrolled may provide a more even spread of nutrients around the pasture area. Can stored forage quality actually be too good for cows? In short, yes or sometimes, but the reality is often the opposite — the quality is lower than expected. The only way to know the starting point in your winter feeding program is to conduct a forage analysis. This information helps determine the most efficient feeding strategies based on the quality of current forage inventories. Additional information on forage analysis methods can be found at www.aces.edu/go/523. This article appeared in the April/May 2018 issue of Hay & Forage Grower on pages 10 and 11.